Reggae on Broadway, Gentleman on MTV Unplugged! Some things are hard to understand. Why so many people undertake a futile chase after happiness instead of just being happy, for example. Or why, after thousands of centuries of evolution and so-called civilization, a large proportion of mankind still hasn't learned what is essential for our future: creating equal rights for all, maintaining peace and preserving our planet. Or why MTV, in 25 years of their popular "Unplugged series, has never featured a Reggae artist. Well, at least concerning the latter, your incredulous head-shake can give way to an enthusiastic nodding of the same, because here it is (drum roll): Gentleman on MTV Unplugged! The pensive Changes, for example, first released on the album Diversity in 2010 – it's one of many lesser known gems in the singer's repertoire, polished to shine with the sounds of a delicate flute. Different Places of his 2007 release Another Intensity, a name that can be taken as descriptive of the song here, coming literally in another intensity. Or the outtakes of Gentleman's successful last album New Day Dawn from 2013: The Journey (what a mood-lifter! ), Road Of Life and In My Arms as well as its title track New Day Dawn in a version leaning exclusively on dynamic percussions, thus winning a completely new taste. There are two features as well that you just can't NOT supply yourself with: Rainy Days, which brings Tamika and Martin Jondo to the fore, and the haunting delivery of Homesick with German shooting star Milky Chance. Most importantly, you would miss a gripping version of Heart Of Rub-A-Dub, and that's just sacrilege. I mean, yes, I'm partial, this song being an all-time favourite of mine, but hear for yourself... its slight deceleration plus instrumental glory plus top-a-di-top vocals is indeed a heart-moving experience. But then again, which of these songs isn't? Let's just pretend you make a sensible decision and purchase the 2-CD Edition comprising all of the 26 songs recorded during two memorable sessions at the exclusively re-furnished Stadtgarten in Cologne, hometown of the artist himself. Apart from the above mentioned titles, you will be rewarded with tender, powerful and at times surprising renditions of 20 years of Gentleman's musical history. Thus he takes us back to 2002 with Leave Us Alone, for instance, which still reflects the anger that made him write these lyrics 12 years ago. We pass through 2004 with Intoxication, a song he dedicates to his wife Tamika, "the one who makes me strong when I'm weak", then proceed to 2007 in Tranquility and reach 2010 with It No Pretty, a song that is exactly the opposite of its title. Walk Away brings us back to the present, and You Remember (both released 2013) seems to capture this time-travel in a nutshell. Since Gentleman has always been someone who looks into the future, it should have been expected that the trip doesn't stop here, and indeed he comes up with some sizzling new stuff as well. Welcoming the great Ky-Mani Marley, the two of them deliver a reproachful No Solidarity which contains great lyrics but lacks the usual melodic characteristic of Mr. Otto's songs. Warn Dem, a combination with the one and only Shaggy, is a joy both to listen and to watch – the accompanying video was the first of the set to be published on YouTube. Speaking of features: next to Christopher Martin on a dynamic To The Top, special mention deserve the songs Big City Life, presented by and with its author Marlon Roudette (does this make it a semi-cover?) and Another Melody alongside Tanya Stephens. Even though it has been recorded four years ago, this was the first time the two artists performed it together. For me, this one is the embodiment of "unplugged" somehow – sweetness! The inclusion of Gentleman's greatest hits such as Dem Gone and Superior makes it easy to mistake the album for a best-of-compilation, but it is so much more... Giving a good impression of this "more", the latter (opener of this auditive feast) enfolds us with the bitter-sweet notes of Dean Fraser's Saxophone. He is one of three Jamaican instrumentalists that lent their spice to the entirety; the other two are Hopeton Williams (trumpet) and Denver Smith (percussions), who is presently touring Europe with Jah Cure. Actually, the exceeding professionalism of all nineteen instrumentalists involved is one of the outstanding features of the album. Of course, the eight members of The Evolution Band (Giuseppe Coppola on drums, Fabian "Odi" Zepezauer on bass, Florian "Stahl" Münzer and Tobias "Tobi" Zepezauer on guitar, Johanna Järemo on sax and Frank "Polle" Pollak - who also acted as musical director - on keys as well as background singers Tamika and Treesha) are old stagers and excellent connoisseurs of Gentleman's music. Sherieta, the most requested background singer of Jamaica at the moment, completed the set vocally, while guitarist Boris Rogowski and keyboarder Antonio "Toni" Farris added further expertise. The special magic touch discernible throughout the 28 titles is interspersed by a string section directed by Pierre-Henri Dutron. Anna-Maria Smerd, Joachim Tschann, Eva Cottin and Maxi Heinicke on violin, Janna Hasanovic, Stella Veloce and Guillaume Bongiraud on cello and Shasta Ellenbogen on viola make the songs rise above the ordinary; I think one could even go as far as saying that they take Reggae music to a new level! In fact, listening closely, you'll discover something special in every song. In Send A Prayer, for instance, traces of the likkle bwoy the artist once was shine through in his voice, traces that became rare in the matured vocal perfection the singer has reached nowadays. Only piano, strings and soft percussions accompany Gentleman on Memories, an emotional obituary for his good friend Buba Werner who passed away two years ago. Almost mystic is the Interlude which has an oriental (Arab? Turkish? Mongolian?) touch, and we'll have to wait for the release of the DVD on December 5th to find out who is behind this enchanting voice. It speaks for Gentleman's great sensitivity to this genre that he chose one of the globally most well-known hymns of Bob Marley, Redemption Song, as the final entry - a masterpiece closing a masterpiece! Ky-Mani Marley and Campino (lead-singer of the German Punk-Rock-Band Die Toten Hosen) accompany him on this legendary track that can be seen as a triumphant sign of victory of our beloved music over the mainstream. Reggae on Broadway, Gentleman on MTV Unplugged! After the daze is lifting and the mind starts to analyze what ears, heart and soul were lavished with during the first round of listening, it becomes clear how exceptional this feat is. 20 musicians, 9 featured artists and 45 chosen spectators were orchestrated in a way that made it possible to record all these songs during two live sessions?! Honestly, that's what I'd call setting high standards, and the whole crew has my deepest respect, especially Ben Bazzazian who was responsible for the production of this baby. Despite all the perfection, a certain warmth permeates the whole album, an intimacy that is expressed in the clinking of glasses, the coughing of guests, the introductory words Gentleman finds for almost every song… Co-producer Oliver Schrader summarizes: "Throughout the preparations and recordings of the sessions, the feeling prevailed that we all were part of a unique experience, something that happens once in a lifetime. The atmosphere was amazing, incredibly intensive... It's one of Gentleman's strengths to make everyone be seen, to feel important and as if he was a long-standing friend." 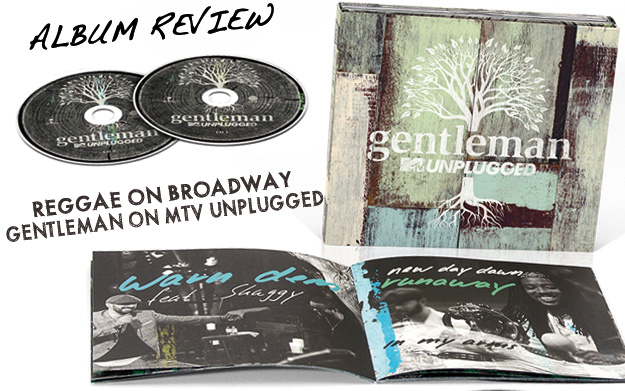 With his MTV Unplugged Album, Gentleman certainly proved more than one strength. Not only did he breathe new life into his songs (the artist himself said that in some moments he felt as if the tracks were just created); he also paved the way for a new understanding of Reggae music, reaching out to new audiences and different circles. One step, come we hold a medi now (in the artist's own words): "This is up to you and me, make we sit down and talk bout longevity, sit down and reason conscious livity, our natural ability – give thanks for diversity!"